I LOVE this Square Bag! Hello Everyone! It's Noelle posting today! A Quick and easy gift! The T is for Terry the owner of Creative Cuts and More! I wanted to give her a little treat and I thought this Square Bag was the perfect holder! The T is chipboard from my stash. I painted it purple with a Paint Dauber. Then I added some Rhinestones from my stash using my Bling Tool. 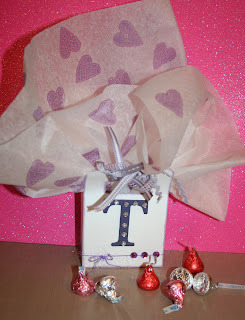 It is SO EASY to quickly decorate a bag or box for a little gift for a friend or a goody bag for a birthday party. I couldn't find tissue paper in my stash to match so I just grabbed some white, got out 4 Studio G heart stamps and went to town stamping all over it. SO EASY! Are you ready for Spring??? 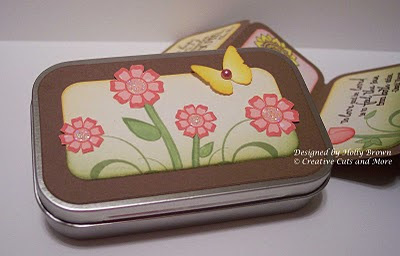 It is gorgeous here in Texas with 75 degree weather this week, ahhhhhhhh......... My thoughts always turn to flowers and butterflies and gardens when I think of spring, and I created this Blossom Tin project to usher in the gorgeous spring weather. 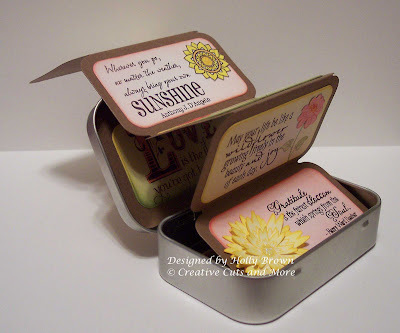 I used the Rectangle Mini Album Tin Set from Creative Cuts and More to start this project. I chose to use smooth cardstock because I wanted to stamp on these. The brown accordian layer (called Album on the website) is Carob Cream Bazzill Smoothies cardstock, and the little panels (called Mats on the website) are White Bazzill Smoothies cardstock. The metal tin comes with this album and they fit together beautifully. The Killer Red Tacky Tape is the only adhesive that keeps the cardstock on the metal tin. Everything else just popped right off, but the cardstock is NOT moving since I used the Killer Red Tacky Tape. All the stamps used here are from Verve. I just pulled out all of my Verve stamps and had a blast picking and choosing which stamps to use. I laid out all of the cardstock pieces and set the stamps next to them to get a feel for how this project would flow. I love the way it turned out! Hello! Today, we are excited to introduce you to one of our talented Guest Designers named CARLYANN! Check out this SUPER CUTE Acetate Hat that she made! *Flower stamp - my minds eye! Hi there Crafters, Steph Zerbe here. I'm bringing back an oldie, but a goody for you today. Here she is, the Cupcake Box Set! The Cupcake Box Set includes 4 pieces. I wrapped the top piece with a strip of fabric tape and the bottom piece with a strip of SU! pattern paper. 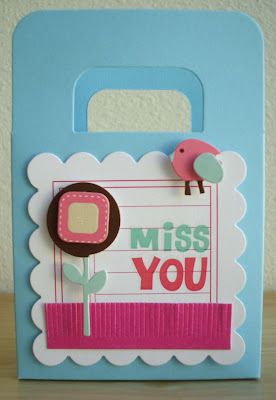 I stamped this adorable image from The Greeting Farm on cream card stock and three pattern papers. I cut pieces from each color and just glued them to the image on cream cardstock. First, I cut the socks from the yellow pattern paper. Then the shoes from the gray. Too cute right? I added little pearl gems to the shoes and covered the stamped buttons on the coat with real buttons. LOVE IT! The insert that holds your cupcake in place. I gave the box some push pin feet. The insert hides them perfectly! You get to choose your colors for the top and bottom! Get your very own Cupcake Box Set HERE! Thanks for stopping by, leave some love!!! 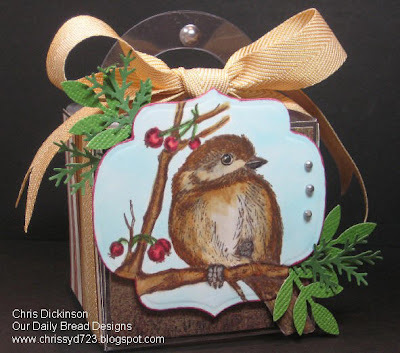 Hi, Lisa here, and I have a really quick project to share with you today using the Window Card Die Cuts from Creative Cuts and More. 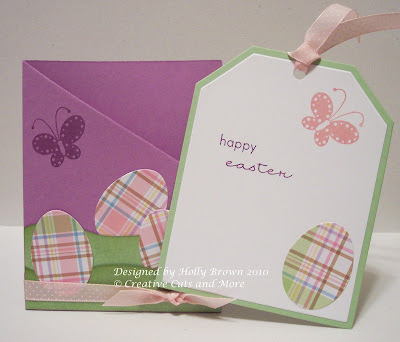 For this card I used the Window Die Cuts with a Mat. The base card is Bazzill White Canvas, the mat layer is Bazzill Lava Canvas. I stamped the flower image from the Artistic Outpost Lovely Day plate in Black Archival right through the opening of the window. Let the ink dry, then colored the image using an H20 Brush and Rose Quartz and Green Olive paints from Creative Inspirations. The sentiment was stamped in Black Archival on the Mat, then adhered to the base card. I love the window cards, because not only does the recipient get to enjoy the image on the outside of the card, it's on the inside too! This is Chris Dickinson from the damp ends of the earth in Wisconsin. Today we are THRILLED to share an adorable Gift Bag from one of our talented Guest Designers JENNIFER HANSEN, if you haven't seen her blog, please take a moment to head on over there and say hello and Ohhhh and Ahhhh over her fabulous projects! 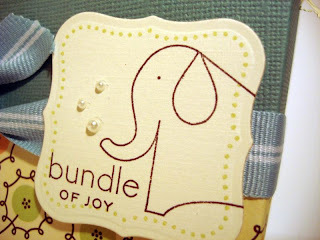 Adhere journaling die cut, stickers, paper frill and apply rubon to the front of the bag. Use red tape to create the bag. This can be used for gift cards, candy, a fun little gift for a loved one that you miss. Create inside and outside of box using Red Tacky Tape. 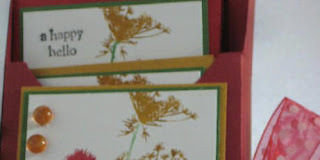 Cut strips of patterned paper and adhere to sides and top of boxes. 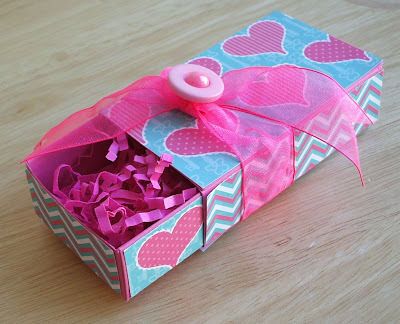 Tie ribbon around the box and add button and pearl to ribbon. 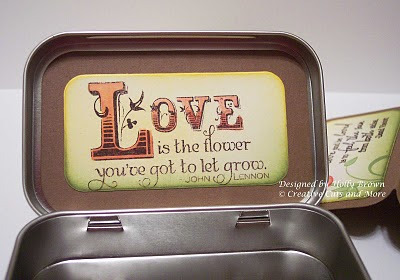 This can be given to someone you love, a wedding table decor item or for Valentine's Day. You could put candies, gift cards or trinkets in the match box. Be sure to stop by Jennifer's Blog and let her know how much you enjoy her work! Thanks again for stopping by! Have a wonderful day! Hopefully this is greeting you on a sunny day! I know a lot of you have had more than your fair share of snow this year. We, unfortunately, here in Oregon haven't gotten very much at all! My son got so excited the first morning he woke up to snow. He could barely wait to go outside and play in it. You can tell by his expression he was just too excited to pose for a nice picture. This was my first time playing with Tacky Tape die cuts and glitter. Boy was it fun! I wanted to give a close up of the frame. In case your wondering what the tacky tape die cuts are like and how you use them I took pictures along the way. First, this is what it looks like. I peeled off one side and put it in a bowl. I then sprinkled the glitter over it and patted it down to make sure it was on there good. I then shook the excess glitter off and peeled off the back and stuck it where I wanted it. It was as simple as that! The Doodlebug glitter bottles don't look all that big, but my container still looks new after using this. there is a TON of glitter in them! I recently ordered a Slash Folder with Tag #05 Set from Creative Cuts and More, and started playing around with it over the weekend. It's actually more like a pocket card but the pocket doesn't fold down. Rather, it is on an angle and you put the tag inside. It's an unexpected and fun little tag pocket. 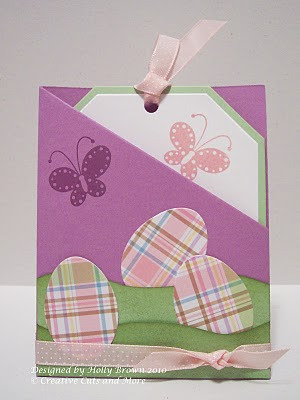 I cut out some eggs from plaid designer paper, stamped the butterflies and sentiment, and threaded some ribbon through the hole in the tag. After playing around with different ways to display the eggs on the front of the slash folder, I decided I needed some grass for the eggs to sit on. So I pulled out some green cardstock, cut it in a wavy freeform, and sponged the edges with some green ink. Hello and Welcome to the Creative Cuts and More Blog Hop! 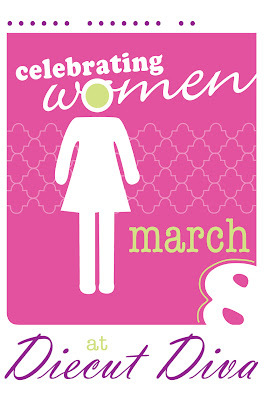 This month we are excited to show you some Feminine themed projects in our Celebrating Women!! Those are a few SNEAK PEEKS for you to enjoy before you go through the HOP! You will definitely NOT want to miss this!! Steph Zerbe here. How's it going? I have something that is a little UNEXPECTED for you today. It's actually NOT a bag or box. I used DCWV pattern papers and printed chippies along with a few SU! rub-ons. Don't those eyes totally work as a perfect Pop-Up embelli?!! Here is the pop-up part. Creative Cuts & More does all the work for you. You just decorate and give! Stop by for some DIECUT DIVA inspiration! so we can stop by your blog. We LOVE to see what you are up to!!! Hi, Lisa here and I've got a cute Peek-a-View Box to share with you today! Who wouldn't want to recieve a cute box filled with goodies! I used the Peek-a-View Box Die Cut in Cherry Splash Bazzill Smoothies for my project. I covered the Cherry Spash with some Basic Grey Sugar Rush Pattern Paper. I used Killer Red Tacky Tape to close the box top/bottom and acetate, filled it with some Mike & Ike Jelly Beans, and tied on a beautiful Red Satin Bow. Just add a tag, and your all set! Can't you just picture these boxes filled with all sorts of things for Easter. Wouldn't they be cute decorated with some Map Scrap Paper and filled with Matchbox Cars for little boys, or decorated with frilly papers and filled with trinkets for little girls. These boxes are really quick to assemble and would look wonderful filled with anything!